Attaining and maintaining the prone position is sometimes difficult for the patient and therapist. In addition, the patient may not be able to tolerate full weightbearing on the shoulder in prone shoulder position. For those not able to tolerate prone, the following shoulder exercise program can be initiated from the seated position with progression to prone as tolerated. The following shoulder strength training and scapular stability program involves utilizing a padded head/chest massage device that can be placed on a hi-low mat. 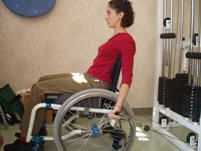 This allows the patient to attain a modified prone position to perform the desired shoulder exercises. The patient can then progress to prone with a wedge under the trunk and prone on elbows as able.